HARMAN Professional Solutions today announced the new Soundcraft Mini Stagebox 32i and Mini Stagebox 16i, offering customers multiple channels of remote controlled I/O for Soundcraft Si series products, including the Si Impact mixing console. The new rack-mount stageboxes are equipped with high-quality components, including Studer-designed preamps, to deliver exceptional sound quality, convenience and robust ease-of-use. Additionally, HARMAN recently released a free firmware update for the Soundcraft Si Impact mixing console that enables up to 80 mix tracks when used in conjunction with stageboxes. The update allows Si Impact owners to add a stagebox for additional inputs, while simultaneously using the existing console inputs. By adding a second MADI option card to the console, customers can add a second stagebox and select which inputs to assign to the 80 mixing channels. In addition, with up to 80 total mix tracks, customers can now handle more complex mixing scenarios, like adding an optional Dante card for receiving from a house router, or outputting to either the back of their console or the stagebox—all while recording up to 32 tracks over USB to a connected digital audio workstation. Soundcraft Mini Stagebox 32i and Mini Stagebox 16i provide multiple channels of MADI I/O via standard Cat5 cabling, eliminating the need to run expensive and heavy analog snakes from the stage to front-of-house mixing positions. Mini Stagebox 32i and Mini Stagebox 16i offer remarkable value while maintaining the industry-leading performance and dependability found in Soundcraft live solutions. 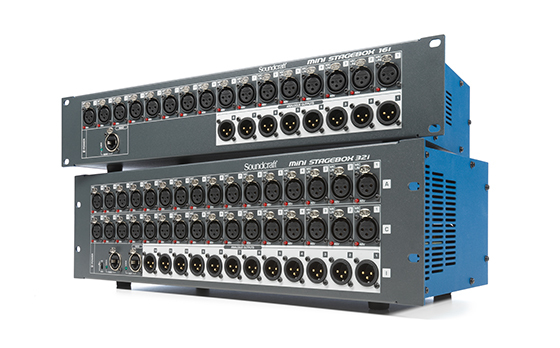 Mini Stagebox 32i and Mini Stagebox 16i feature a streamlined design that provides essential connections and features, including a MADI over RJ45 connector built right onto the chassis. No local hardware configuration or option cards are needed or required—engineers can simply plug in, power on, select inputs and control remotely using a Soundcraft Si console. Dedicated XLR mic pre inputs allow 32 or 16 simultaneous channels of external analog input. 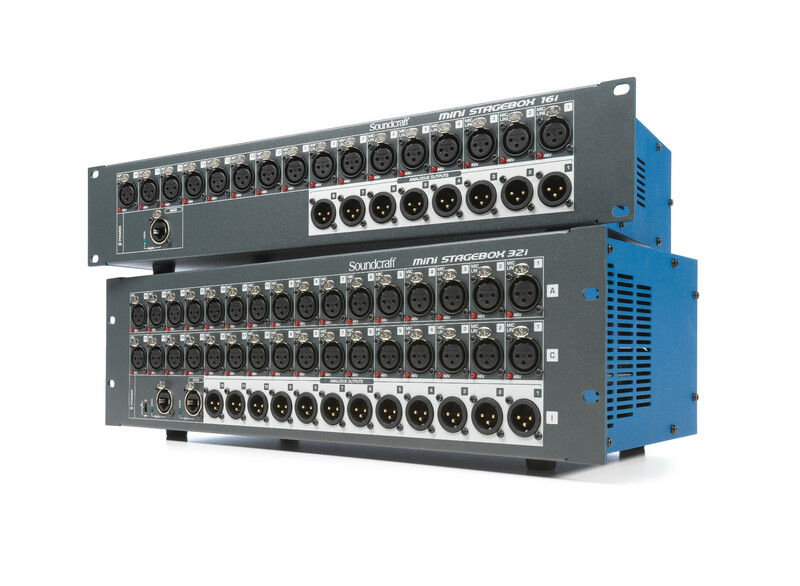 Mini Stagebox 32i offers twelve analog outputs, while Mini Stagebox 16i offers eight analog outputs for easy connection to house and stage monitors and broadcast or streaming feeds. The Soundcraft Mini Stagebox 32i and Mini Stagebox 16i are expected to be available in May 2017 with a price to be confirmed at time of writing.